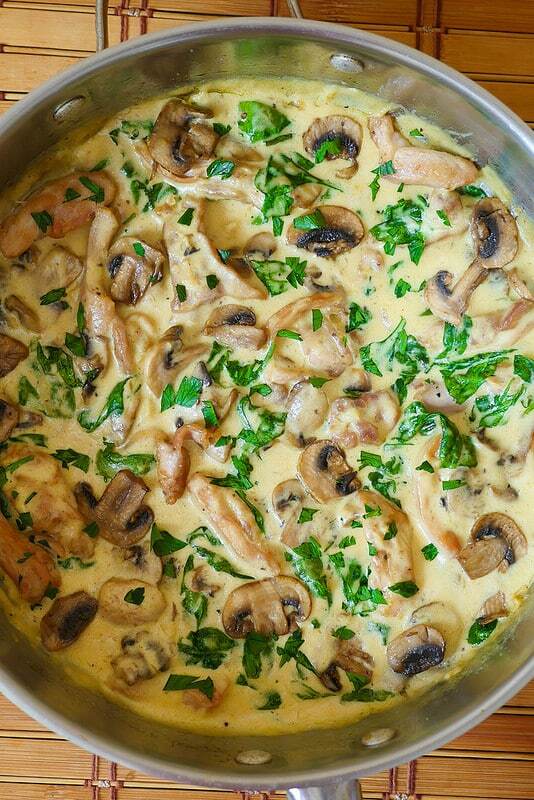 Chicken and Spinach in Creamy Mushroom Sauce - What's In The Pan? 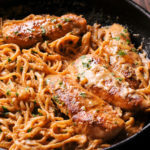 And while you are cooking this tasty creamy chicken and spinach dish – your entire house will smell like a top notch Italian restaurant just like my parmesan chicken pasta – all thanks to garlic and Parmesan. And don’t you just love the smell of garlic being cooked? I used to eat spinach only in spinach salad until I discovered how wonderful it tastes in combination with other ingredients, especially chicken and mushrooms. 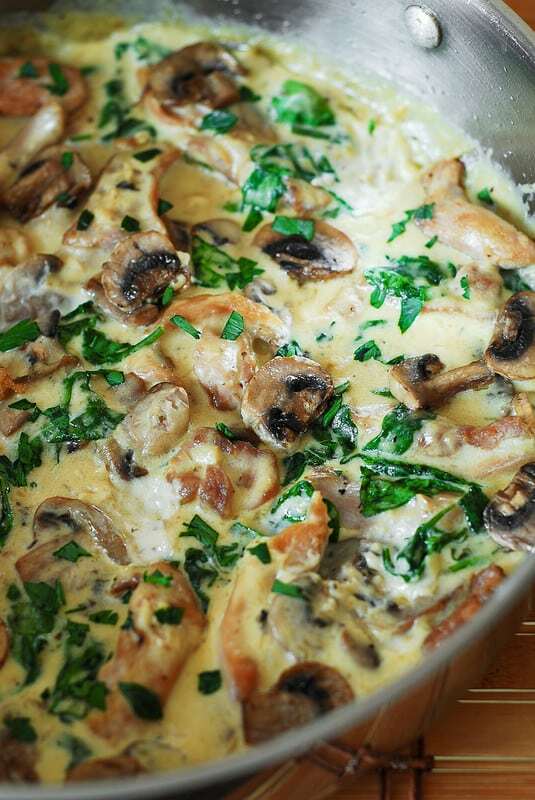 Chicken, mushrooms and spinach is the perfect trio here! I initially set out to make chicken spinach pasta, but instead I added adding mushrooms and omitted pasta and this definitely added more texture and flavor here. It’s also important that all ingredients in this chicken and spinach dish are cut up in small pieces before cooking starts and that includes chicken. I used boneless and skinless chicken thighs because they are juicy, full of flavor and don’t dry out like chicken breast. I recommend you do the same. Make sure to use one of your sharpest knives to cut the chicken thighs into thin slices. Cutting the chicken used to be such a chore for me until I discovered that I was using the wrong knife! When cooking mushrooms you don’t have to add any extra oil to the pan. When heated, they release moisture fairly quickly and will brown in their own juice. And I just love the transformation of the plain white mushroom into a much darker and yummier version. To make it wheat free, use cornstarch or rice flour instead of regular flour. Cornstarch as a substitute: Cornstarch has twice the thickening power of flour, therefore you will need to use 1/2 tablespoon cornstarch. 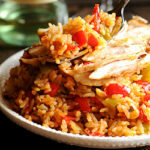 Rice flour as a substitute: If using rice flour, substitute 1:1, namely use exactly 1 tablespoon of rice flour. 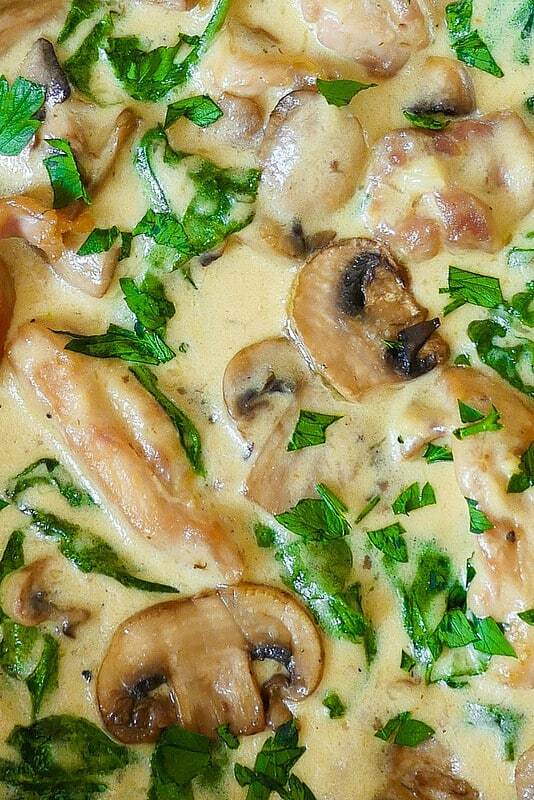 What does creamy parmesan mushroom sauce taste like? I am pretty happy that the sauce for this chicken, mushroom and spinach dish turned out to be not too cheesy, so you don’t have to feel guilty about eating it. It’s rather light – has a little bit of cream, a little bit of milk, very little butter and only half a cup of Parmesan cheese. Yet it still tastes rich. You can eat this amazing chicken and spinach dish as a main entry or with a side of pasta or rice. 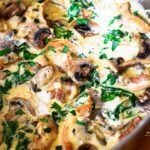 I love chicken mushroom spinach combination – it’s simple, tasty and never fails no matter what! 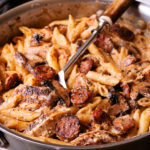 Our new favorite creamy chicken recipe is Cajun Chicken Pasta dish! It’s ready in less than 30 minutes and is so unbelievably good that I cannot recommend it enough. Chicken and mushrooms: In a large skillet, add olive oil and heat it over medium high heat. When the pan is hot, add chicken and cook for about 5 minutes on each side until browned. Season chicken with salt and pepper right inside the pan. Remove it onto a plate and add the sliced mushrooms in. Add in salt. In about 5 more minutes, your mushrooms should look nice and moist, and dark. Once cooked, remove them from the pan. I put them on the same plate as the cooked chicken strips. Sauce: To make the sauce, add butter to the pan, allow it to melt and then cook garlic in it until slightly browned – only for a couple of minutes. Add 1 tablespoon flour (omit flour if you like your sauce to be a little more runny). Slowly add chicken broth, half-and-half and Parmesan cheese. All these will blend in very quickly. Add salt slowly and taste the sauce to make sure the salt level is to your liking. Spinach: Add spinach to the sauce and allow it to wilt. I added 1 cup of spinach, but you can certainly add more or less depending on your preference. Putting it all together: Add the chicken and mushrooms back into the pan and mix in well. Serve warm and garnish it with parsley, if desired. 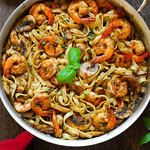 Eat as is, or serve along pasta or rice. Had this for dinner tonight. I didn’t use as much garlic & I added more spinach but otherwise followed the recipe. Family loved it. Thanks for sharing. Delicious and so sumple to make! Thank you for coming back and letting me know how it turned out! I made this tonight. OMGGGGG SO yummy!! Loved it! Add lots more spinach!! too creamy, needs more spice. needs to be served with rice or potatoes! Loved this!! The sauce was amazing! I used baked chicken breast and added it on top at the end. A little time consuming but worth it!! Garlic was strong. Next time use 2 cloves. Used 2 breasts instead of thighs. Fried flour with butter and garlic. Under seasoned, could’ve used some onion. Got a 7 from hubby. Served on shell pasta. Sorry, I meant cornstarch** in my last comment. Also, do you also need to chop the spinach before adding to the mixture as well? No need to chop spinach. Hi. What can I substitute chicken broth with? 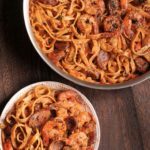 Ask can I use cornstart and water 1:1 instead of flour? Or is it going to change the taste? Cornstarch has twice the thickening power of flour, use 1/2 tablespoon cornstarch.